As some of you may know, I am a holo junkie. I just can't get enough. I love how the rainbows appear in different lighting and angles. Swooooooon. I'm going to tell you guys something about me you don't know. I do not own anything designer-unless you count my Chanel nail polish. I refuse to spend that kind of money on clothes and shoes. I think it's stupid and ridiculous. Yes I love to look at many magazines and fantasize that if I were rich, what designers I would wear. Chanel, Ralph Lauren to name a couple. My wardrobe consists of prairie skirts from Old Navy and tee shirts from Victoria Secret. Their clothes really are nice. If I find something I like, I buy it in all colors and call it a day. I'm not picky like that. Why am I sharing today? 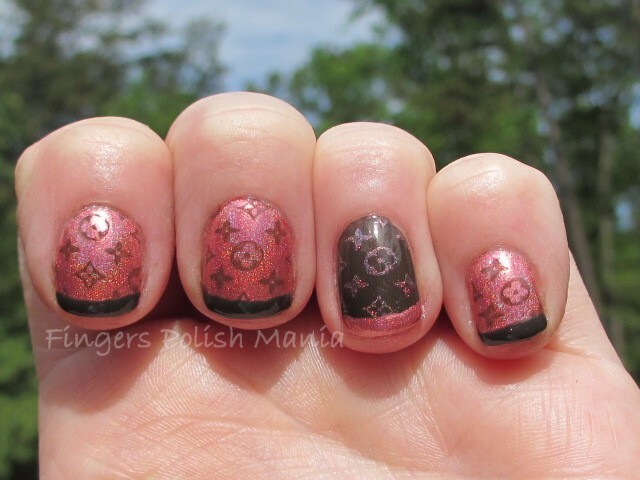 Well I think the design on today's mani is reminiscent of Louis Vuitton. But I have nothing to compare it to. So you will have to tell me ok? First up, we have the required silly bottle shot. Yes I know what you are thinking. OMG it's pink again???? What is wrong with her? Am I right? 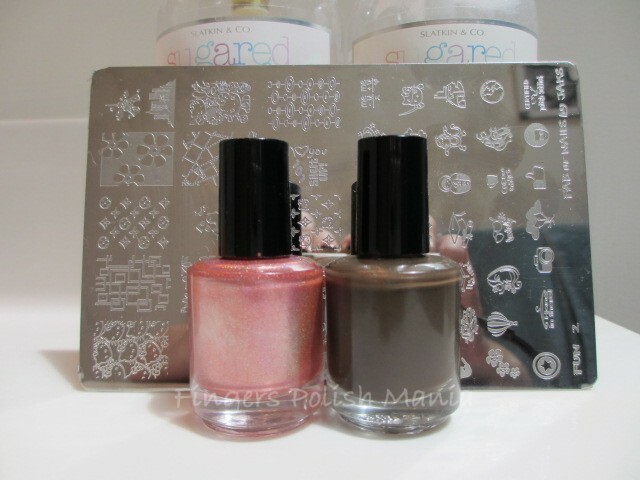 This is actually a peach holo so relax people! 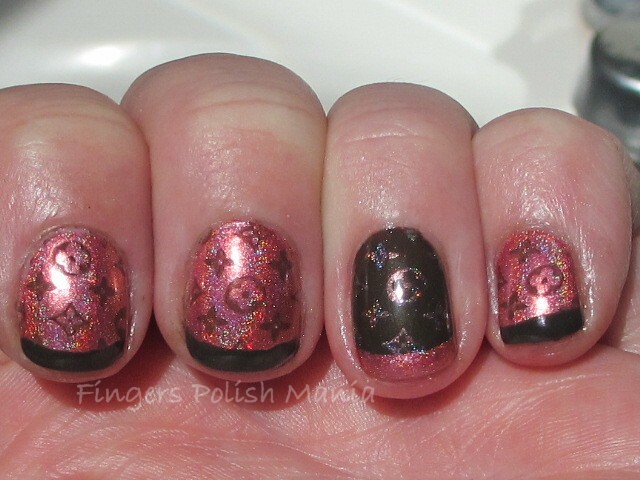 This is Enchanted Polish Pinky and the Brain and Elevation Polish Pico de Fogo with Fab Ur Nails Fun plate 2 in the background. I started with Pinky and an accent of Pico. The sun was hiding for this part so the holo will come later in way too many pictures ok? Oh how I just love holos! I'm going to say that a lot today! 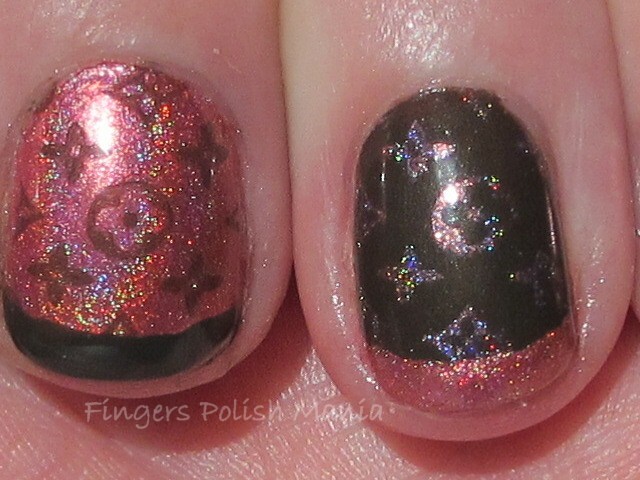 This is a peachy pink holo and Pico is a deep dark chocolate brown creme. I think these two go together so well! 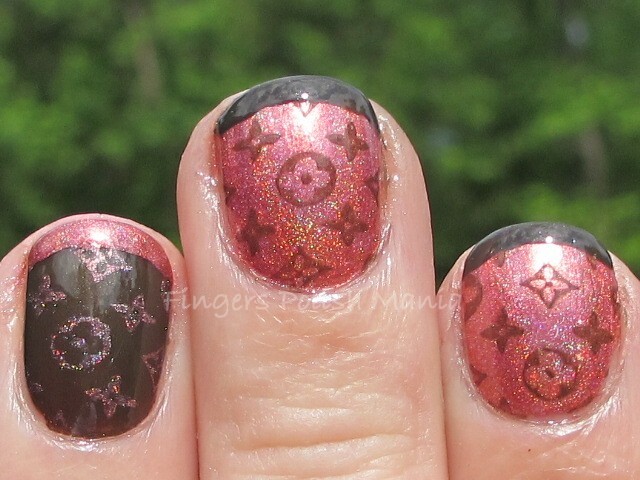 Next I stamped with OPI Get in the Espresso Lane because the Pico just wasn't doing the job. The OPI is a little darker than the Pico. I used the Fun 2 plate and topped it off with my funky. Here are the glorious rainbow filled results. OMG! That last macro shot just says it all doesn't it? Look at all the rainbows in just that one nail! How can you not love this? I love the brown pink combo. So chic. Now tell me people-is this the Louis Vuitton design? 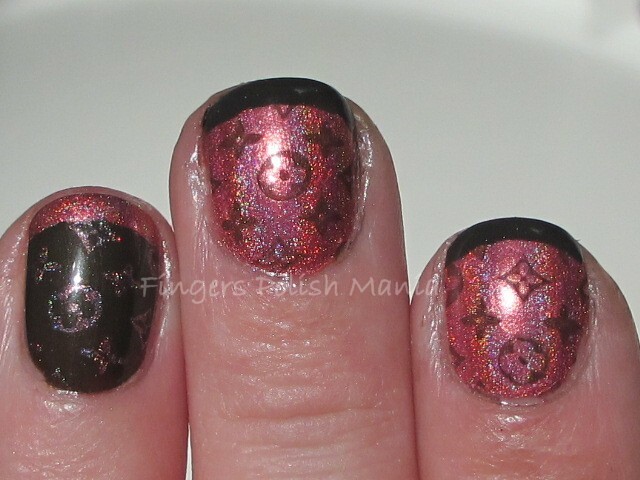 Do you love holos too?